Privatbanken was established in 1896 and continued its operations until 1921 when it went bankruptcy due to losses in exchange rates. The owners of the bank were well-known Finnish businessmen, noble families and Mr. Axel R. Ehrnrooth, who was always in charge of the bank. The main reason for problems of the bank was a 10 mio loan in Swedish Crones. 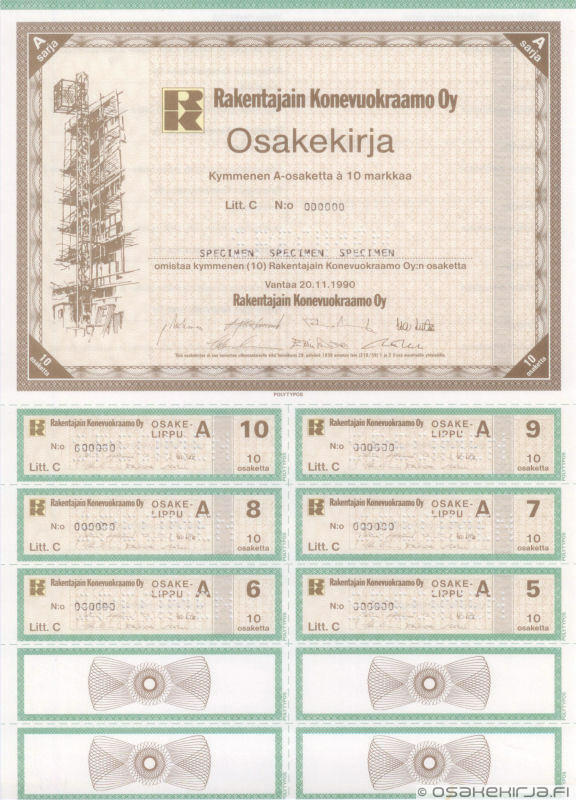 During the WWI the inflation of the Finnish Mark was extremely fast because the Finnish Mark was connected to the Russian Rouble, as Finland was part of the Russian Empire. Finally in 1921 the loan was too high in Finnish Marks to be taken care of and the good parts of the bank were transferred to Pohjoismaiden Yhdyspankki. 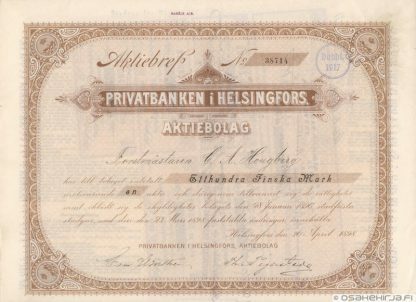 The shares of Privatbanken were listed in the Helsinki Stock Exchange from 1912 to 1921. Nature of business: Commercial banking. The house of the bank in Helsinki was designed by Mr. Lars Sonck and the bank’s head office has been said to be one of the most beautiful ones in Finland. Later the premises became famous as the “Jugend hall”, where the City of Helsinki held exhibitions and which is now a café. The house was built by Mr. Jegor Uschakoff. Read also a compact brochure of Privatbanken. It’s written in English, in German and in Russian. Auction results: 18.09.2011 72 EUR.